On March 1st, Suzuki-san took Matt and I to go see a glass-making workshop, where we got gifts of cute little glass dragons (since it's the year of the dragon). Blown glass blows my mind (pun intended?). Even watching people work with it, it makes no sense to me. Molten glass just seems sorta terrifying to work with, so kudos to anyone who actually does so. On the way there, I found out that the presentation for the mayor about how to improve tourism to Minakami had not been forgotten about. It was happening on the 6th, right after we visited a local high school. After checking out the glass-making place, Suzuki-san treated us to lunch at his friend's pizza place, and then we went to the tourism office to talk about stuff for the presentation with some of their English-speaking staff. Oh, but I forgot to mention, before that, and before Nikko, I got a chance to try to go skiing. It pretty much sucked. I was going to go with Matt, but he forgot and made other plans, so my host sister recruited one of their acquaintances to help me out (Maeda-san). He was a really good instructor, but I went into the whole thing feeling lonely and awkward and uncool, plus ski boots are incredibly, incredibly difficult to walk in and in my case somehow incredibly painful to wear. It's hard to learn anything when you can feel the bruise forming on your leg. Plus trying to learn something you have absolutely no background knowledge in in a foreign language is pretty difficult. It took a really long time before I could figure out what it was Maeda-san wanted me to do. Turns out I'm also kinda afraid of swooping down hills at a high velocity (I think it reminds me of all the trees I ran my bicycle into as a child), so I didn't even make it to the ski lift. We got as far as walking up the hill a little, putting skis back on, and trying to go down the hill before I had enough. It was dark and cold and snowing and I was just over it. 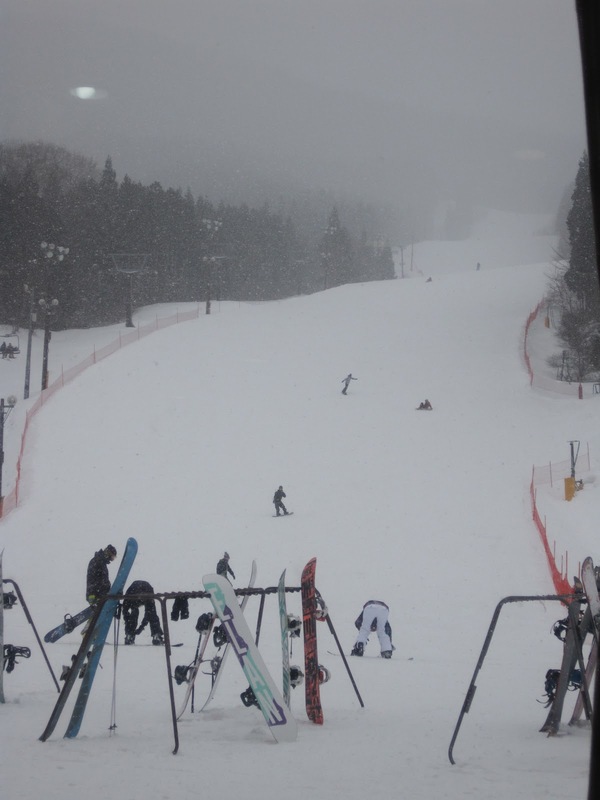 Plus I learned later from multiple people that Norn, the ski lodge we went to, is actually the hardest place to ski in Minakami, but it's Maeda-san's home base, so there wasn't really any helping that. It did, however, explain all of the terrifying snowboarders zipping past me while I prayed that they knew how to stop because I sure didn't. I'm not too keen to try skiing again, but maybe if friends or family really wanted to go I'd give it another shot. Here's a picture of the slope. I'm not in it. So okay, after that interlude, back to chronological time. On the 5th, I took the day off because it was Monday and I'd agreed with both my workplaces that I could have Mondays off. So I hung out and ate Hagen-daaz and drank coffee with Yuki and didn't do a whole lot of anything until we went to go pick up Matt at 6:30ish. Then he came over for dinner and we stayed up until about 1am making the tourism presentation. Then, bright and early on the 6th, we went to a high school (I'm not sure if there's more than one high school or not, and I forgot the school's name). We weren't really sure from the onset what we were there for, but it turned out that we were going to be coming to one class and helping them with English conversation. They had prepared questions ahead of time that we were to answer. It was hard to tell how much of our English they really understood, and there were some students that definitely weren't paying much attention. But once class ended, they were really excited to take a photo with us. After class, a few students talked to us in the hallway, and I wish I'd given them my email address or something so they could stay in touch. One girl had done a week-long homestay in Wyoming, but the others I think had just been in Japan their whole lives, and they had very good English. One girl really wanted to study abroad in Canada. We also got to meet their ALT, Phillip, and he seemed really cool. Apparently he's been in Japan for seven years. The kids really seemed to like him. Outside of the high school. Japanese high schools really do look exactly like anime and drama, by the way. Fang Fang, a Chinese woman who's also been in Japan for seven years and is living in Minakami and working at the tourism office with Suzuki-san and Abe-san, joined the English conversation class with us. Some of the students were studying Chinese so they were excited to talk to her and they mobbed her after class to take pictures with her. I was sad we had to leave the high school after just one class, but I guess Suzuki-san and Fang Fang -san had to get back to work, so Matt and I got to hang out in the meeting room at the city office preparing (read: playing computer games. Also preparing) while we waited for our presentation time. The presentation went pretty well thanks to all the preparation time we got, and the only mistake (that was pointed out - loudly - by my host mom) was me typing one kanji wrong in the names of both the places where I worked (in my half-asleep state I typed 官, not 館. I'm not sure what that first kanji means). Overall I'm really proud of what we accomplished. And after that we went on some sight-seeing adventures, which I'll cover next time. That sounds really interesting Shaun. I'm curious what you two actually presented. How do you think tourism could be improved in Minakami? Sorry about your ski experience. From my minimal ski experience in Wisconsin, I learned that ski boots are designed to help keep you in a somewhat squatting position with bent knees making normal walking very uncomfortable. Adding rental boots on top of that can as you know turn out to be painful. If you plan to go again, do lots of wall sits or squats to make sure your quads are very strong. The location and snow looked amazing, however! So pretty. We have had no snow at all-practically no winter at all. So very strange for the Midwest. By the way, what does ALT mean (Phillip). My ski experience is minimal as well. But I agree with you..the boots are uncomfortable, and speeding down the hill is terrifying. The way I dealt with it was pretty much yelling the whole way down, which probably wasn't very pleasant for the others on the hill, but for some reason seemed to help me. Luckily for everyone my sking days are over! :) Chris loves snowboarding(and Rebecca too although she hasn't gone as much) and might be able to give you some tips! Glad you were able to get an opportunity to go. Hey, just stumbled upon your blog whilst surfing the net. I'm actually also a Minakami ALT - Phil is a neighbour. Saw this post and was amused to read about your skiing experience and Fang Fang, whom I met once or twice when I went skiing with her and a bunch of Chinese exchange students. I live in Minakami so I'm a bit biased and love it. I am always curious about other foreigners' perceptions... and when new foreigners visit our town. I am an American and I was a dancer/ Showgirl. I used to dance at the Minikami Hotel Juraku. I love Minikami and its lovely residents. I saw a picture of the river (I don't remember the name) in the snow and such sentimental feelings came over me. Minikami is beautiful and I hope it endures and prospers. Kansai trip day 3: Kyoto!